The negimiso or onion-miso sauce recipe I posted over on Just Hungry last week belongs to the third category - it’s a foundation type recipe for Japanese cooking - but it’s really well suited to bento dishes. Here are three of my favorites - all quick to make if you have a batch of negimiso on hand. For all of the recipes here, I’ve used variation no. 1 of the negimiso recipes, using a light brown miso and cooked to a loose-sauce state. I did use a sugar substitute for the sugar, but you can use regular sugar (which will be better). Any of the negimiso variations should work just as well. Yaki onigiri is a filled or unfilled onigiri rice ball that’s grilled until crispy on the outside, then coated with some sort of sauce. 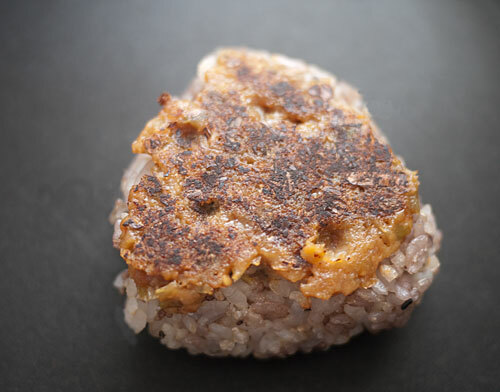 Negimiso is perfect for yaki onigiri. 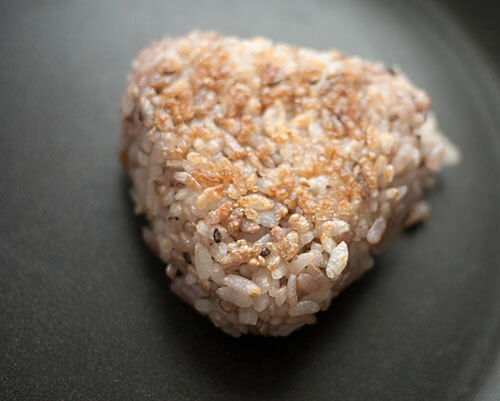 For yaki onigiri, make sure your rice ball is quite firm, or it may fall apart. Don’t put salt on the surface, since the negimiso is salty enough. Filling the rice ball is optional. The negimiso alone will add plenty of flavor, so if you use a very salty filling like umeboshi, use less than you normally would, e.g. half an umeboshi. The first step with any yaki onigiri is to pre-cook the rice ball to crisp and firm up the surface before applying sauce. The traditional way to do this is to use a wire grill that’s meant for grilling mochi cakes or fish, but you may not have one of these. Ridged grill pans don’t work too well either, because the ridges are too big and rough for a ball of rice. There are two quick ways to accomplish this pre-cooking. One is to pop the rice ball into a toaster oven, and toast it on both sides. The other is to just cook the rice ball on each side for a few minutes in a dry non-stick frying pan (or a regular frying pan with a thin film of oil or sprayed with non-stick spray) over medium-high heat. I’ve used the frying pan method here for this brown rice and zakkoku (multigrain) onigiri. This negimiso yaki onigiri can be eaten hot as a snack or at room temperature in a bento. Plan-ahead note: If you have leftover rice, form it into plain, unsalted onigiri and wrap well in plastic wrap. Freeze. To make yaki onigiri, just defrost one of your frozen onigiri and turn it into a yaki onigiri. This is something I came up with when I was trying to make a yaki onigiri and it fell apart in the pan. 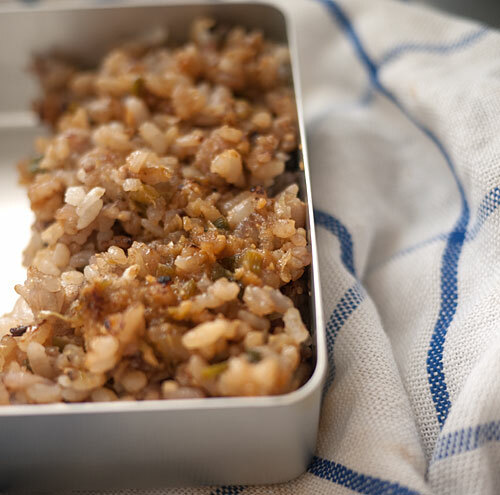 I love the combination of crispy rice and the salty-sweet flavor of the negimiso. I actually make this more now than yaki onigiri! Spread pre-cooked rice thinly in a non-stick frying pan, or a frying pan that’s been spread lightly with oil or sprayed with non-stick cooking spray. You can add a little sesame oil for flavor if you like, but only add a tiny bit - you don’t want this to get greasy. Leave the rice to cook over medium-high heat - resist the urge to stir it around! It will turn crispy on the bottom. Once it has become crispy, add about 2-3 teaspoons of negimiso per cup of rice, and stir around well to distribute the negimiso evenly. Let cook before packing into a bento box. 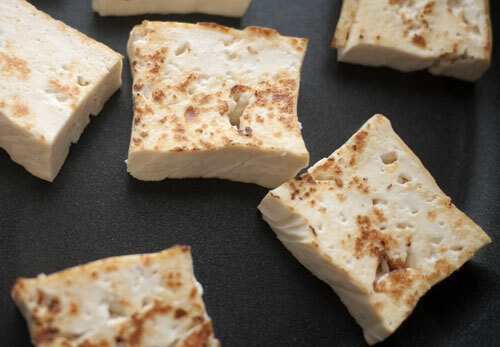 Negimiso is a great foil for the blandness of tofu. This is a very nice vegan protein dish that omnivores should like too, since it’s packed with umami. Use extra-firm tofu that has been well drained - see using tofu for bentos. Cut into bite size pieces, and put in a single layer in a non-stick frying pan, or a frying pan that’s been spread lightly with oil or sprayed with non-stick cooking spray. You can add a little sesame oil or even butter for flavor if you like. Turn the tofu over after a few minutes to cook the other side. They should look like this. 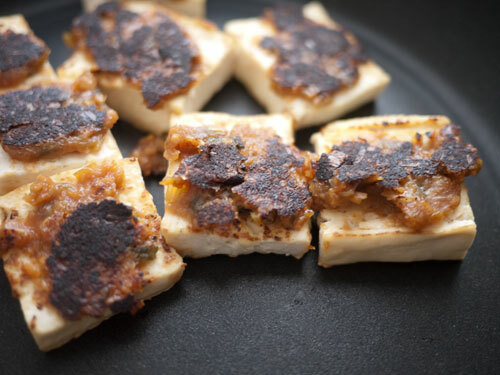 Spread one side of the tofu pieces with negimiso, and turn over to cook for a few minutes. Again, the negimiso is potent so you only need to spread it on one side. Pack these tofu nuggets with a plain, bland accompaniment like plain rice, not with the yaki onigiri or rice above, because that becomes too much of a good thing at once. Oh, yum! I'm on a reduced-carb diet, so I'm not sure when I'm going to let myself have yaki onigiri--I love them so much that I'd probably want to eat six. Heeheehee. ;) But the crispy rice looks good too, and I'm sure I'll have leftover rice at some point. I really want to try it. The tofu, of course, is a totally great choice for my current diet, served with vegetables rather than rice. Can't wait to try it. Thanks! I made this last night for dinner with friends. It was quite a talking point and they must have enjoyed it because it was all eaten! I also made some plain (with smiley faces) and furikake (from a packet) ones. Thanks for the recipe! The only problem was, the surfaces that I fried on the onigiri got quite chewy. Is that expected? The surface does get chewy, but ideally it should get to chewy-crispy rather than just chewy. Try leaving the onigiri in the pan a bit longer, and/or turn the heat up a bit, so that it goes beyond the chewy state to a bit crispy. Thanks .. looking forward to experimenting. I made the yakidofu today, and had the same problem as last time -- the negimiso spatters like crazy when I turn the cubes over (too much oil? ), and ends up sticking more to the pan than the tofu (not enough oil?). Any suggestions? Pan too hot or too cold? Maybe I didn't reduce the negimiso enough?